TGI Fridays is working on a number of new burgers as possible candidates to join their Burger Bar menu including one skewered with pork rinds. - Mac & Cheese Burger (testing in Buffalo) - Crispy macaroni and cheese and beer sauce plus spicy mayo made with Tabasco Chipotle Pepper Sauce, hickory-smoked bacon, lettuce, tomatoes, and red onion on a buttery Challah bun. - Hatch Chile Burger (testing in Miami) - Sriracha-Jack cheese, crispy jalapenos, spicy mayo made with Tabasco Chipotle Pepper Sauce, hickory-smoked bacon, Hatch chile salsa, lettuce, tomatoes, and red onion on a buttery Challah bun. To top it off, it comes skewered with a spicy jalapeno pub popper. - Spicy Ranchero Burger (in development) - Grilled chorizo, ranchero sauce, cabbage, jalapenos, pico de gallo, and a fried egg on a buttery Challah bun. It comes with a mini bottle of Tabasco sauce plus it's skewered with crispy pork rinds. - Philly Cheesesteak Burger (in development) - Roast beef with peppers and onions plus melted Swiss, cheddar, and Monterey jack cheeses on a buttery Challah bun. Additionally, it's skewered with Philly cheesesteak eggrolls. - Thai-na-mite Burger (in development) - Sriracha aioli, Ponzu slaw, cherry-candied bacon, and spicy kimchi pickles on a buttery Challah bun. It's skewered with a pork rib. 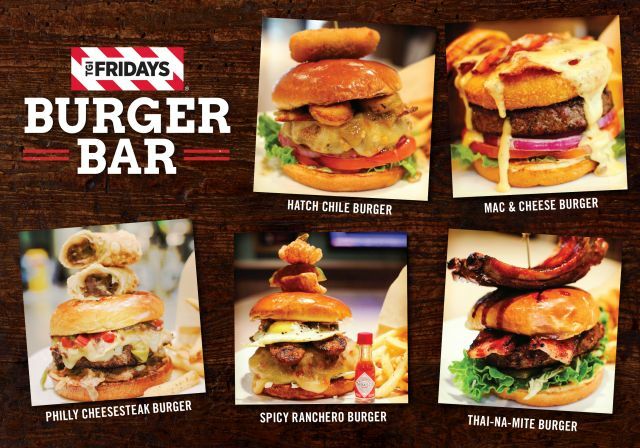 In case you'd like to chime in on which burger you'd like to see new, Fridays is accepting comments on their Facebook page as well as their Instagram.